Umbrellas with embroidery on their sleeves can look amazing. Embroidery on the umbrella sleeve can be combined with traditional printing methods. Most of the umbrellas we manufacture are made to measure, this means we make them from scratch to suit your requirements. That means we can offer a combination of decoration techniques to complete your design. 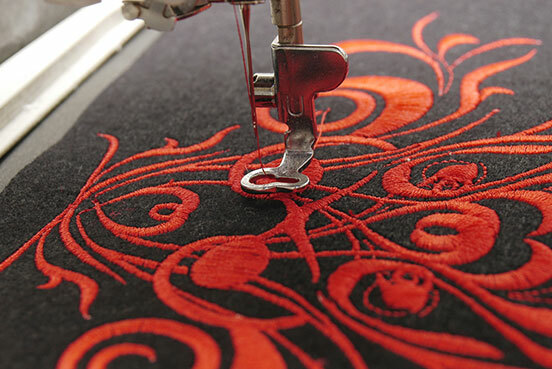 Our factories use the latest in computer controlled multi-headed embroidery machines. Woven labels or woven tags on umbrellas can add subtle branding to an umbrella often associated with premium brands. An embroidered label on an umbrella can appear on the outside and inside of the umbrella as well as on the umbrella sleeve. We can offer a range of embroidery on umbrellas, from panel designs to tags, labels and sleeve decoration.